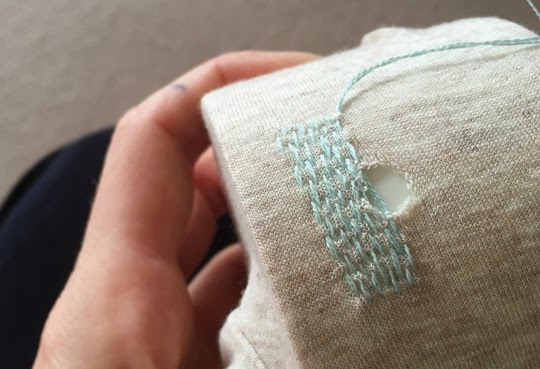 One of the things I've been looking forward to in my year of mending – let's face it, probably the only thing I've been looking forward to – is the chance to try visible mending. 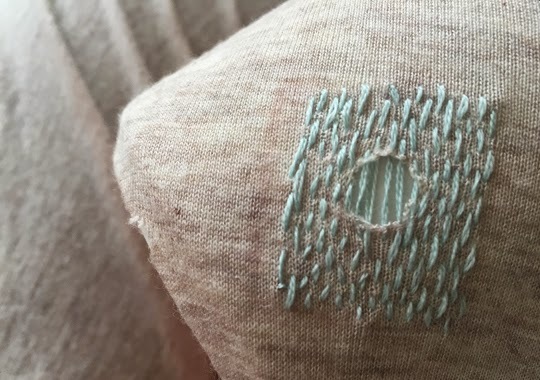 For those of you not familiar with this process, it uses traditional mending and darning techniques, but makes a feature of them, rather than trying to make the mend invisible. The undisputed king of the visible mend is Tom van Deijnen (or Tom of Holland as he's known online) who started the Visible Mending Programme "to highlight that the art and craftsmanship of clothes repair is particularly relevant in a world where more and more people voice their dissatisfaction with fashion’s throwaway culture". I've been raving about the latest issue of Uppercase since I bought it and one of the (many) reasons is the feature on Tom shown below. Obviously I wasn't going to start with anything quite so ambitious, instead I went for a basic darn using some different colours. The top is actually a cotton knit of my sister's that's a bit worse for wear as you can see. I marked out where I was going to stitch with a fabric marker and since I don't have a darning egg I used a coffee cup (I am making-do after all). I used two strands of cotton embroidery thread since the knit itself is also cotton. I could have got closer to the weight of the garment thread by using one strand, but it didn't seem sturdy enough. 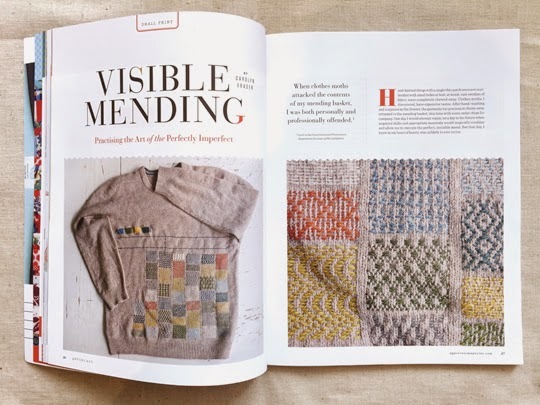 Martha Stewart actually has a good little graphic showing how to darn, and the link to it is on my 'Make Do and Mend' Pinterest page, along with some other examples of fun visible mends. Once the vertical stitches were all in place it was time to weave with the horizontal thread. And there you have it! It's not perfect, but I think that's part of the attraction. As you can see from the pic, there are other holes still to go. I've got five in total, which I'm mending in pale blue, red, green and yellow. 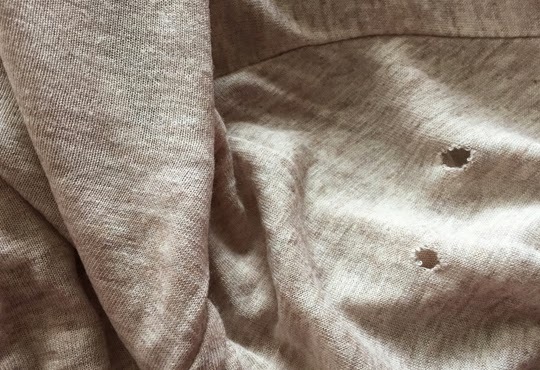 Then I think I'll try a bigger mend... My very favourite knitted jacket developed elbow holes the year before last so I think some colourful visible mending will be perfect to brighten it up for winter. 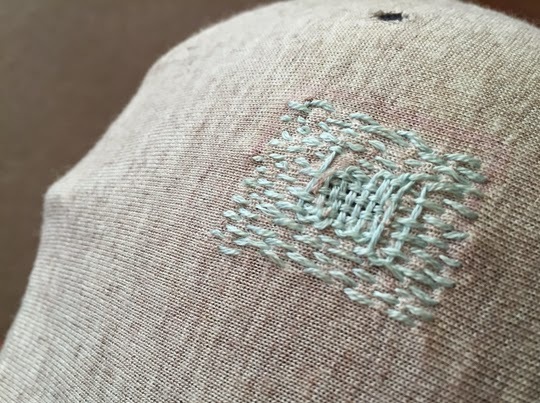 Has anyone else tried a bit of visible mending?